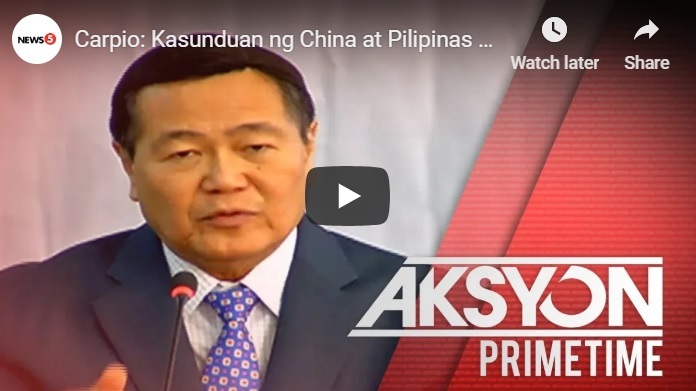 [VIDEO]: Carpio: Kasunduan ng China at Pilipinas sa oil at gas development, walang nilabag na batas. Carpio reiterates his call for a more vigorous campaign to change the mindset of the Chinese that the West Philippine Sea does not belong to China. He also said that there are bills pending in Congress that push for the declaration of portions of the West Philippine Sea as a marine sanctuary. He said the Philippine government should continue to assert its rights over the West Philippine Sea. It should do something to fortify the ruling given by the Permanent Court of Arbitration in The Hague in 2016 every year. The ruling states that China has no legal basis for its nine-dash line territorial claim. He also said that Filipinos should take time understanding the issues. That way, they could better explain the country’s position to other nationalities. They have the mission to convince other countries of the Philippines’ position. This is in the hope that together they could convince the Chinese people that the West Philippine Sea does not belong to them. The Supreme Court Justice knows that China will never accept the ruling. Not unless the Chinese people realize that their historical narrative 2000 years ago is false. Since grade school to college, they have been taught that they own the South China Sea. They really believe it because they were not taught other things,” he said. However, it seems vague how the Filipinos with the help of other nations can change the mindset of over 1.3 billion people. This can actually cause more tensions between the two countries. Previous post: How’s the Possibility that Candidate for Senator, Atty. Glenn Chong is the Real Ambush Target?